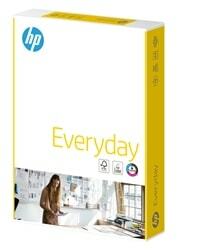 HP Everyday A4 75gsm paper is a high white paper (CIE161) made from 100% eucalyptus pulp from sustainable forests. This gives it a high bulk content so that it feels and performs more like a heavier weight paper. Ideal for memos, meeting notes, reports, email attachments and print-outs, HP Everyday paper is compatible with all laser printers, copiers and fax machines. With ColorLok technology for improved results when inkjet printing – quicker drying time, bolder blacks and more vivid colours. HP Everyday paper also keeps your office equipment clean and healthy by removing microscopic dust particles that can cause wear to fusers and rollers. FSC certified. Produced using FSC accredited pulp from well-managed forests independently certified according to the rules of the Forest Stewardship Council. ECF. PEFC. ISO9706. ISO 14001.